(Nanowerk News) Since the first laser was invented in 1960, they've always given off heat -- either as a useful tool, a byproduct or a fictional way to vanquish intergalactic enemies. But those concentrated beams of light have never been able to cool liquids. University of Washington researchers are the first to solve a decades-old puzzle -- figuring out how to make a laser refrigerate water and other liquids under real-world conditions. In a study In a study to be published the week of Nov. 16 in the Proceedings of the National Academy of Sciences, the team used an infrared laser to cool water by about 36 degrees Fahrenheit -- a major breakthrough in the field. "Typically, when you go to the movies and see Star Wars laser blasters, they heat things up. 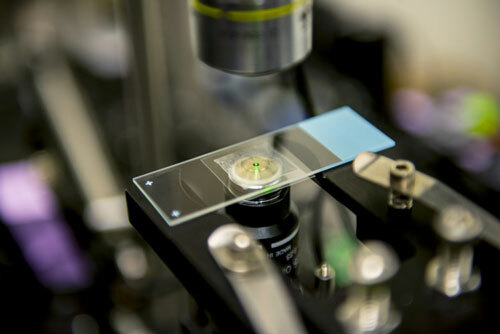 This is the first example of a laser beam that will refrigerate liquids like water under everyday conditions," said senior author Peter Pauzauskie, UW assistant professor of materials science and engineering. "It was really an open question as to whether this could be done because normally water warms when illuminated." The discovery could help industrial users "point cool" tiny areas with a focused point of light. Microprocessors, for instance, might someday use a laser beam to cool specific components in computer chips to prevent overheating and enable more efficient information processing. Scientists could also use a laser beam to precisely cool a portion of a cell as it divides or repairs itself, essentially slowing these rapid processes down and giving researchers the opportunity to see how they work. Or they could cool a single neuron in a network -- essentially silencing without damaging it -- to see how its neighbors bypass it and rewire themselves. "There's a lot of interest in how cells divide and how molecules and enzymes function, and it's never been possible before to refrigerate them to study their properties," said Pauzauskie, who is also a scientist at the U.S. Department of Energy's Pacific Northwest National Laboratory in Richland, Washington. "Using laser cooling, it may be possible to prepare slow-motion movies of life in action. And the advantage is that you don't have to cool the entire cell, which could kill it or change its behavior." The UW team chose infrared light for its cooling laser with biological applications in mind, as visible light could give cells a damaging "sunburn." They demonstrated that the laser could refrigerate saline solution and cell culture media that are commonly used in genetic and molecular research. Typically, growing laser crystals is an expensive process that requires lots of time and can cost thousands of dollars to produce just a single gram of material. The UW team also demonstrated that a low-cost hydrothermal process can be used to manufacture a well-known laser crystal for laser refrigeration applications in a faster, inexpensive and scalable way. The UW team also designed an instrument that uses a laser trap -- akin to a microscopic tractor beam -- to "hold" a single nanocrystal surrounded by liquid in a chamber and illuminate it with the laser. To determine whether the liquid is cooling, the instrument also projects the particle's "shadow" in a way that allows the researchers to observe minute changes in its motion. "The real challenge of the project was building an instrument and devising a method capable of determining the temperature of these nanocrystals using signatures of the same light that was used to trap them," said lead author Paden Roder, who recently received his doctorate from the UW in materials science and engineering and now works at Intel Corp.
"Few people have thought about how they could use this technology to solve problems because using lasers to refrigerate liquids hasn't been possible before," he said. "We are interested in the ideas other scientists or businesses might have for how this might impact their basic research or bottom line."